Find hotel near Hiralakshmi Memorial Craf .. If you have special liking for traditional artwork, then you cannot give a miss to this beautiful handicraft park. Established by Mr. Chetan Shah, this park was opened to preserve and promote the beautiful artwork of Kutch. After its opening in the year 2005, the park receives nearly 400 footfall in every week. Take a tour in this park and you will come across many small stalls selling beautiful craftwork, done by local craftsmen of Kutch. The park also has a beautiful Radha-Krishna temple and a lotus pond that beautifies the entire ambience. For children, electronic rides are there for entertainment. All in all, it’s a nice place to spend few hours with family. Check the timings from the authorities before visiting. By hired car by auto. How popular is Hiralakshmi Memorial Craft Park? People normally club together Tapkeshwari Temple and Bhujia Hill while planning their visit to Hiralakshmi Memorial Craft Park. It's few kilometers from Bhuj city. This place gives message of peace and harmony. I visited in evening when all lights were on giving nice visual experience. Good place for shopping handicrafts. The park has a show we couldn't get tickets for. Apart from that it also has replica structures of parliament and the red fort. You can probably skip this if you have been to Delhi. Locals love them though. 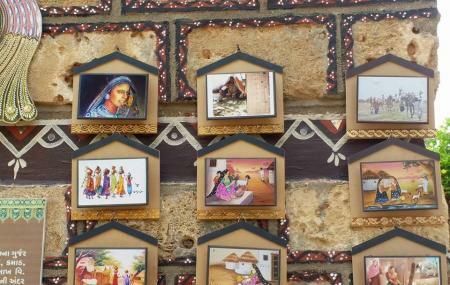 One of the most beautiful attraction of kutch tourism. Craft park, museum, food court..all are well maintained, neat and clean. Special attraction is the facade show. Must do visit place. Atmosphere is is very peaceful. Well behaved and helping staff.